Hello friends!! Giovana here with a new post. 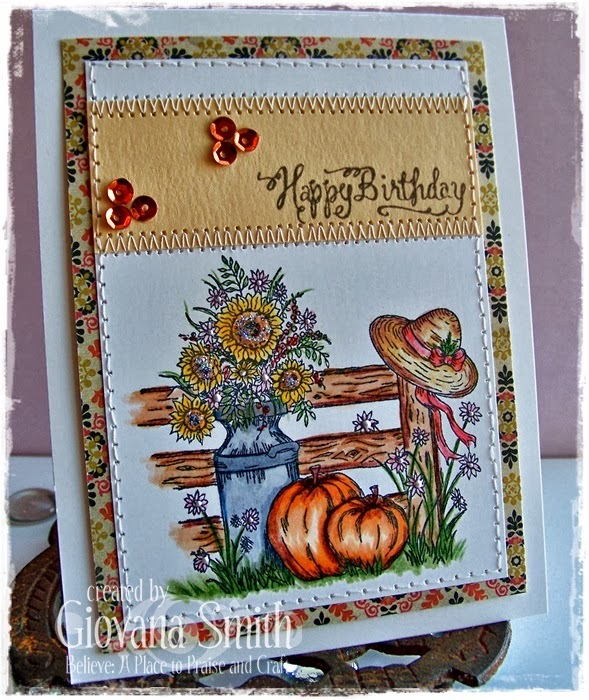 Today I am bringing you a Fall Birthday card. I really like how it turned out. For my project I used Fall Garden image and the sentiment is from Sweet Sentiments. I stamped the image on White Cardstock in Memento Tuxedo Black Ink, colored the image with Copic Markers, then added some shades with Prismacolor Pencils. I added a strip of Yellow cardstock and matted it with Patterned Paper and added stitches. Then stamped the sentiment in Coffee Archival Ink. Added gold sequins and Start Dust Stickles and White Opal Liquid Pearls to the flowers. Super easy to make and to mail too!! Beautiful card Giovana! I love the design with all the stitching and touches of sparkle!